Technology has the enviable ability to revolutionize for-profit business, non-profit impact, and everything in between. A recent study conducted by the Pew Research Center entitled "Cell Phones in Africa: Communication Lifeline" found that today cell phones are as common in South Africa and Nigeria as they are in the U.S. According to Mashable, an estimated 5 billion people will use mobile phones by 2017. Cell phones continue to act as lifelines for marginalized and impoverished populations. One such population is LGBTQ asylum seekers in the U.S. LGBTQ asylum seekers are people who are coming to the U.S. due to persecution in their home countries based on their sexual orientation or gender expression. Just a year ago, there was no online, centralized database specifically designed with the purpose of connecting LGBTQ asylum seekers in the U.S. with basic human needs service providers in their city. Co-founded in July of 2014, AsylumConnect is a volunteer initiative that seeks to empower LGBTQ asylum seekers in the U.S. through providing them with much-needed information. 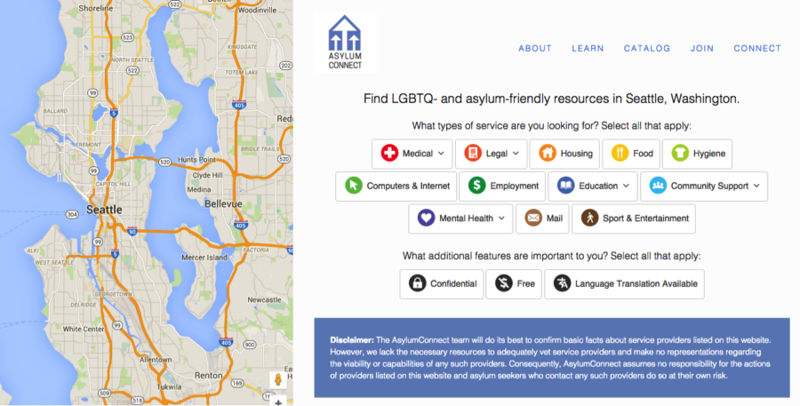 AsylumConnect is creating the first website and web-friendly mobile application to feature an online, centralized database of service providers useful to LGBTQ asylum seekers in the U.S. 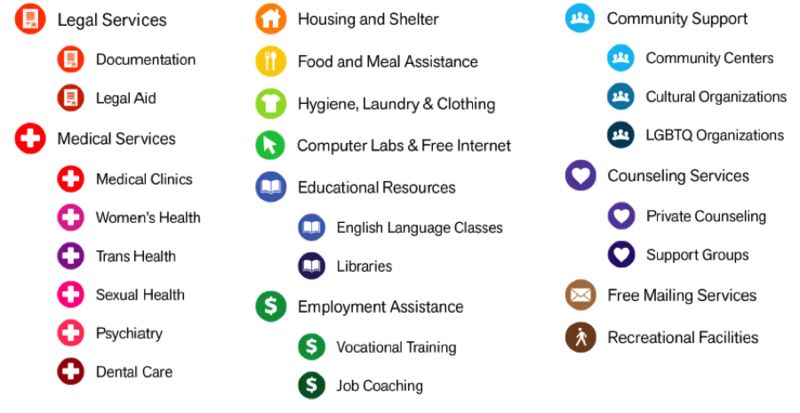 The AsylumConnect catalog will help LGBTQ asylum seekers find basic human needs resources upon their arrival in the U.S. This simple idea has the potential to directly benefit an estimated 300,000 asylum seekers. The AsylumConnect catalog is piloting in Seattle, Washington. The version 2.0 of the AsylumConnect catalog is now live for the Seattle area. The catalog 2.0 features new search functions and improved visuals. It also includes an updated verification model aimed to better ensure that each resource listed is able to accommodate LGBTQ asylum seekers. The resources listed in the new catalog underwent a standardized and more comprehensive verification screening. 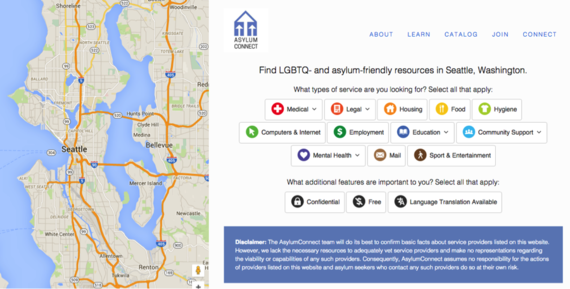 Specifically, the AsylumConnect team strives to verify that each resource listed is: 1) active, 2) friendly to LGBTQ community members, and 3) will serve LGBTQ asylum seekers. 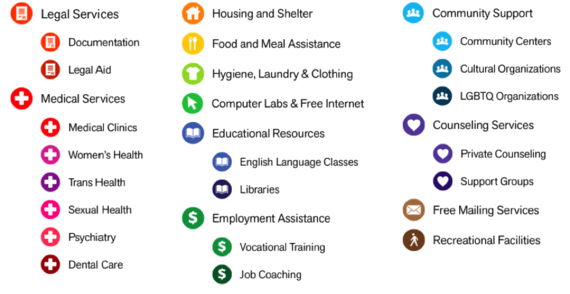 A revised catalog platform features improved search capacity, information visualization and aesthetics to help connect catalog users with useful resources in their area. 3. For instance, user selects "Mental Health" - "Support Groups"
The launch marks the beginning of a testing and observation period during which AsylumConnect staff will assess the efficacy and accessibility of the catalog, and engage with users to guide quality improvement. Lessons from this pilot will be applied to future versions of the catalog, and eventually towards expansion of the catalog into additional U.S. cities. The long-term vision of AsylumConnect is to harness the power of technology to transform how LGBTQ asylum seekers connect with basic human needs service providers in the U.S. Follow AsylumConnect on Facebook, Twitter (@AsylumConnect), and Instagram (@asylumconnect).